A massive Capcom Unity blog post has debuted the latest Robot Master in Mega Man 11, Blast Man. The post goes over who he is, what his battle is like, and of course what Mega Man earns once he defeats him. The post also introduces a new mode for the game, called Balloon Attack. As you might expect, Blast Man is a big fan of explosions, and that’s reflected in his stage. The stage is a mix between the remnants of a theme park and a movie studio, with “Blast Man Adventure” advertised on billboards throughout. 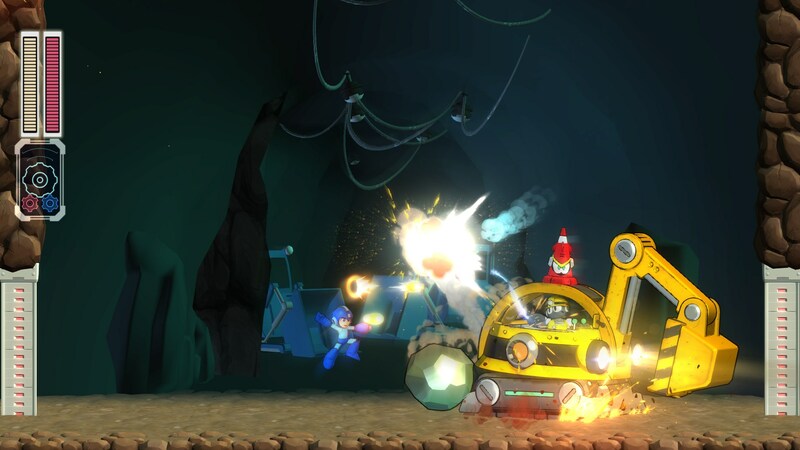 Not only does Mega Man have to contend with Sniper Joes and new, fireball-launching enemies in the stage, several explosive obstacles are also a factor. A mid-boss featuring explosive mini-bots riding a rocket-shaped roller coaster will meet you halfway through, and Blast Man himself should be self-explanatory. After winning the fight, Blast Man relinquishes the Chain Blast, which Mega Man can use to attach multiple explosives to enemies before detonating them remotely. The Power Gear can be used in tandem with the weapon to create even larger explosions. Balloon Attack is a new mode for Mega Man 11 that’s in place in addition to a more standard Time Attack. All the enemies in stages are replaced with blue and red balloons, with the blue balloons being objectives and the red ones hazards. Popping red balloons adds to your time, as does missing blue ones. Mega Man 11 is set to release on October 2 for PlayStation 4, Switch, Xbox One, and PC.